The Coloplast Self-Cath Straight Tip Catheter family of latex-free catheters from Coloplast offers patients a variety of options for intermittent self-catheterization. Each Coloplast catheter is made with the highest quality standards dedicated to patient co1mfort and ease of use. 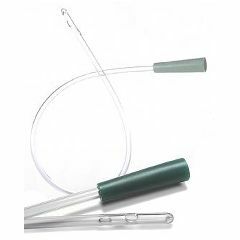 The Coloplast Self-Cath Straight Tip Catheter is 100% latex-free with fire-polished eyelets and a siliconized surface for smooth insertion. The Curved Packaging allows for easier storage, without the worry of damaging the catheter while storing it in backpacks, wheelchair pouches, purses, etc. The Coloplast Curved Packaged Catheter has all of the same benefits as the Coloplast Self-Cath Straight Tip Intermittent Catheter. Very smooth, no rough edges anywhere. Firm but not too firm, voiding is very quick with a 14fr. by Crabman from Sav, Ga.
With the shorter length packaging it is much easier to slip into a pants pocket or transport than the standard strait 16 inch catheter's packaging. I also find prepping and handling the catheter for use to be easier. The only down side is it does take a little getting used to inserting with the 180&Acirc;&deg; curve at the midway point.